This is the second part of a set of reviews of taprooms in and around Asheville, North Carolina. The first part is at this link. As I wrote in the first part, I mostly concentrated on relaxing and enjoying these taprooms and breweries during my visit to North Carolina. But I do enjoy writing these kinds of posts, and during these visits, I did make some notes on the beer and the atmosphere, and take a few pictures. Again, these reviews, like the Richmond reviews, reflect my experiences during a brief visit, and they should be regarded as such. It's hard to really take in a brewery or a taproom in one visit, but these are my first impressions, nonetheless. There wasn't a lot that really stood out to me at Green Man Brewery, other than the size of the Friday night crowd. The whole place was crowded, even the bar, and it seemed to be a popular location. The waitstaff was friendly and helpful, and although the four beers I sampled in my flight weren't particularly compelling, none of them were bad. I should be honest up front and say that my visit to Green Man was at the end of a long evening of sampling beer in Asheville, and my palate was probably a little muted by the time I got to their taproom. The first thing I tried was Thriller, their seasonal IPA with blood oranges and beets. I didn't think I'd like it much if I could really taste the beets in the brew, but they were probably there mostly for color. They weren't in the foreground on the taste. The main thing I noticed with this beer was the citrus atop the hops, and although it was a little synthetic, it wasn't bad. I should have had this beer later in the flight, though, because the lightest beer in the flight followed it, and I could hardly taste that second beer at all. I will assume that Green Man's Vienna Lager is a perfectly fine lighter offering for people who are looking for that kind of thing. I certainly didn't find anything offensive about it, and my inability to really appreciate it probably had something to do with where I positioned it in the flight. The Green Man ESB had the typically glossy, slightly sweet tone of an English bitter, and the porter was malty and slightly spicy. All of that is according to the brief notes I jotted on a coaster and stuck in my pocket. I struggled a bit to read what I'd written on that coaster today, and I noticed that the picture I took of my flight looks kind of blurry. Make of that what you will, as per my suitability to review a brewery at this point during my tour. And please note that while I was visiting taprooms in Asheville, I was traveling exclusively by Uber. Safety first. I should also note that the Uber drivers in Asheville are friendly and helpful, as has been the case with all of my experiences with Uber. I like the way they do things at the Olde Hickory Brewery Tap Room in Hickory, North Carolina. For starters, this isn't just a tap room, it's a fairly large restaurant with a full menu. During my visit I had a sandwich and Irish roasted root vegetables that were pretty good. I ate at the bar, and sampled the brewery's beer, and Olde Hickory lets you custom design flights to suit your palate and your tolerance. You can get just a sample or two, if that's what you prefer, and only be charged a dollar, or a buck-fifty, for each sample (depending on whether or not you order imperials). Or, if you'd like and if you have safe transportation, you can set up a line of samples of everything they have on tap. A flight of twenty beers is overkill for me, I'd lose the tuning to really taste anything at the half-way point. But I do like the idea, and really appreciate the ability to customize your own tasting experience. 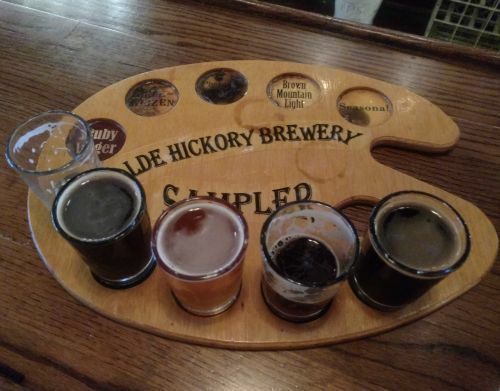 I tasted five of Olde Hickory's beers, and enjoyed every one of them. I started with their Table Rock Pale Ale, which I thought was zesty and dry, but still a clean ale that ought to please just about anyone. Then I had the Black Raven Black IPA, which I really liked. My notes for that beer say "Rye?" And that must mean I thought I tasted rye in that beer's mix, which is always something I enjoy. Next I had the Redeemer Imperial IPA, which was strong, very bitter, and slightly dank. I'd have enjoyed a full glass of that. Then came Hickory Stick, which I thought was a serviceable stout. My notes mention that I picked up on a little coffee and a slight sweetness, and that I thought this beer would have the potential to grow on me if I tasted it again. Lastly I had Event Horizon, Olde Hickory's Bourbon Barrel Stout, and I was surprised at how aggressive it was. North Carolina has a tight restriction on beer as per ABV. Nothing above 15% can be sold in the state. In my notes I reminded myself to look up the ABV at some point, because I'd forgotten to ask the bartender and she was busy with other customers. I was surprised to see that Event Horizon isn't even quite 9% ABV when I looked it up, because this is definitely big-boy beer. It was as rich and strong and had as much whiskey character as some of the extreme bourbon barrel aged stouts I've tasted. I wouldn't have minded going back for more of that one. Based on what my friends say, and what I read on the internet, Wicked Weed seems to be the trendiest brewery in the trendiest beer town on the east coast right now. They have two locations in Asheville, one is a traditional taproom and restaurant, and the other, called the Funkatorium, is focused on the brewery's sours and odd beers. These two locations are so distinct from each other that they really do need to be reviewed separately. They're as different as they can be. First I visited Wicked Weed's Brewery Pub, the location of their taproom, restaurant, and bottle/souvenir store. 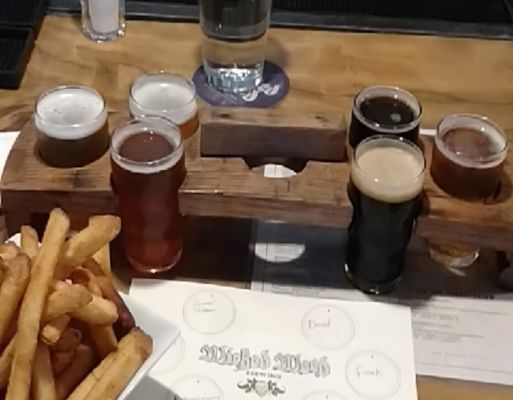 At the taproom they do flights of six, and I sat at the bar and had french fries with my samples. 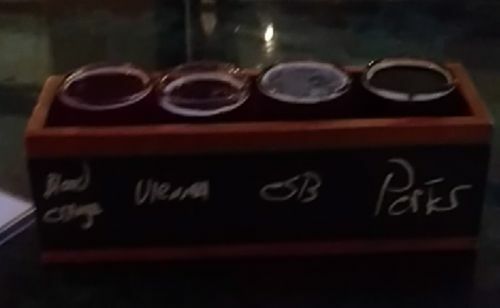 All six of the beers I tasted were very good. I started with their Sweet Talker session ale, which I thought was actually very good for a session beer. In my notes I wrote that I was surprised by the strong presence of hops, top to bottom, and the dry, warm finish. Next I sampled Pernicious, an IPA. My notes for that beer begin "Well, this is just lovely." Other words I jotted down include "citrus, lemon, etc... could go for a full glass." The third beer I tasted was Ryenoceros, a rye IPA that grew on me just over the course of the few sips in a flight glass. My notes begin "Not as good as other rye IPAs," and then conclude "Strong finish. I judged this too soon." Then I had Freak Of Nature, a West Coast Double IPA, and my notes for that beer are just a string of adjectives scattered with "damn" and "wow." I brought a bottle of that home to taste, I'll write a proper review for it when I do. Then came Devil's Night Ghost Pepper Black IPA, which I absolutely loved. It was the highlight of the flight for me. It was my intention to revisit Wicked Weed the next day and get a growler full of this beer to bring home, and I'm kicking myself for not remembering to do that. Devil's Night is the best pepper beer I've ever had. I was shocked at how strong and dominant the pepper flavor was without wearing thin or getting old. I guess my tongue might have been fatigued by all of that pepper if I'd had a full glass, and I wish I'd ordered a glass in order to find out. But, again, my intention was to get a growler, and I forgot. Dammit. Lastly I tasted Aye Aye, a stout that was, according to my tasting notes, "Fine, but cannot follow the pepper beer." Wicked Weed's Brewery Pub is a must for any beer fan visiting Asheville. There is plenty there to satisfy any palate. My only complaint was that the place was so damn crowded, it was difficult to even walk through. Blame the current popularity of beer that actually tastes good, and embrace it while you can. Wicked Weed's Funkatorium is a second location, a few blocks away from the pub, that specializes in Wicked Weed's sours, specialties, and "funky" beers. It speaks volumes for Asheville, and the popularity of the craft beer scene, that such a place exists and thrives. I am just thrilled to see the culture surrounding craft beer reaching such a state of vitality that places focused on flat out weird beer can become as popular and successful as the Funkatorium seems to be. Compared to the Brewery Pub, however, the Funkatorium is quaint. It has a vibe that's more like an outdoor cafe (there is a patio), and although the crowd there was enthusiastic, it was decidedly smaller than the packed-to-the-gills throng at the Brewery Pub. Sours are a new style for me, and I asked the bartender to set me up with a flight featuring her recommendations, in the order she thought I should have them. She was happy to do just that, and everything I tasted was remarkable. First up was Marina, a blonde sour with peaches aged in wine barrels. It was complex, juicy, and just incredibly rich. Then came La Bonte Pear, a beer I loved enough to bring a bottle home. A full review will follow at the blog. Then came Montmaretto, from Wicked Weed's canvas series. This is a sour made with cherries and almonds, and it was far more nuanced than I expected. I didn't pick up on the almonds, per se, but I thought I detected notes of barrel aging. This beer is probably beyond my palate at this stage in the game, to be honest. Lastly was Silencio, a sour made with coffee and vanilla that is aged in bourbon barrels. This beer was absolutely beyond me. I know that for certain. I want to try it again when my ability to discern sours is better tuned, but for now I know when I'm outgunned. I had no idea what to make of Silencio. Wicked Weed's Funkatorium was pretty next-level for me. This degree of sophistication and complexity seems to be where craft beer is going now, if not as a whole then at least in terms of a very dedicated niche. For me, this is like discovering craft beer all over again, and the Funkatorium is a great location for such a discovery.